When Russian aircraft bombed a remote garrison in southeastern Syria last month, alarm bells sounded at the Pentagon and the Ministry of Defense in London. The Russians weren’t bombarding a run-of-the-mill rebel outpost, according to U.S. officials. Their target was a secret base of operations for elite American and British forces. In fact, a contingent of about 20 British special forces had pulled out of the garrison 24 hours earlier. British officials declined to comment. 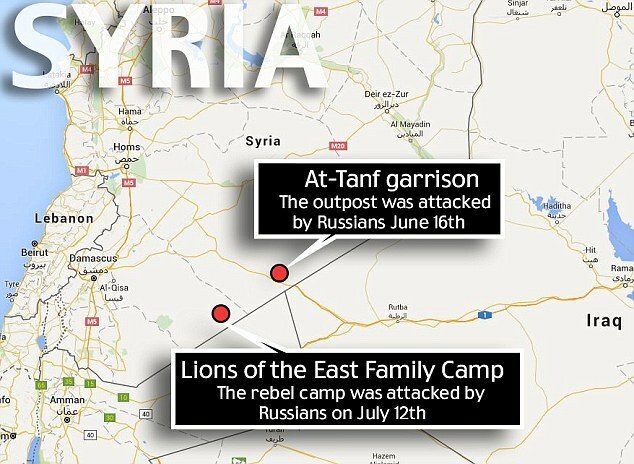 Russian aircraft bombed a remote outpost in Syria used by U.S. and British special forces in June, and then in July hit a camp housing families of Central Intelligence Agency-backed Syrian fighters. The risk that U.S. and British forces could have been killed at the border garrison hardened opposition at the Pentagon and the CIA to accommodating the Russians. But White House and State Department officials, wary of an escalation in U.S. military involvement in Syria, decided to pursue a compromise. Yury Melnik, a spokesman for the Russian embassy in Washington, referred questions about the incidents to the Russian Defense Ministry, which didn’t respond to a request for comment. A provisional agreement reached by Secretary of State John Kerry in Moscow last week—over Pentagon and CIA objections—calls for the former Cold War adversaries to join forces in strikes against the Nusra Front, Syria’s al Qaeda affiliate. In exchange for the U.S. easing Moscow’s international isolation, Russia would halt airstrikes on the U.S.-backed rebels and restrain the Syrian air force. Talks are still under way between U.S. and Russian experts over the designated areas where the Russians would have to get Washington’s approval before conducting strikes. Proponents of the deal in the White House and the State Department say it will allow the U.S. to target Nusra in areas which have been off limits to American attack aircraft for months because of Russian deployments, and will provide a measure of protection to U.S. allies on the ground in Syria whom the Russians and Syrians were targeting in their air campaigns. Critics of the deal at the Pentagon and the CIA say the White House gave in to Russian bullying and voiced doubt that Moscow would abide by the terms of the agreement. They say the U.S. needs to confront the Russians more squarely. White House and State Department officials are wary of intensifying a costly proxy fight that could exacerbate the level of violence in Syria. Since its armed intervention on behalf of Syrian President Bashar al-Assad last September, the Russian air force has conducted hundreds of sorties against CIA-backed rebels fighting his government, fueling U.S. anger. Officials close to Mr. Kerry said he shares the skepticism of military and intelligence officials about Russian intentions, which was why he inserted a clause during the negotiations to allow the U.S. to unilaterally suspend cooperation with the Russians if they started bombing U.S. allies again. U.S. and British special forces based in Jordan cross the border into Syria on missions, helping maintain an unofficial buffer zone on Syrian soil to protect Jordan from Islamic State, U.S. officials said. The special forces would rendezvous with their rebel allies at the garrison, initially used by the CIA. For security reasons, the forces wouldn’t spend the night. U.S. officials said four rebels were killed in the Russian strikes. After the Russian aircraft returned to base in western Syria, the Pentagon demanded that Moscow explain what happened. Russian military officials initially told their Pentagon counterparts that Russian pilots intentionally struck the garrison, but thought it was an Islamic State facility, according to the U.S. officials briefed on the incident. U.S. military and intelligence officials rejected that explanation and said the Russian pilots would have been able to tell from the air that the garrison wasn’t an Islamic State facility because of the unique ways in which it was fortified. Among the protective measures surrounding At-Tanf were interlocking sandbag walls that are a signature characteristic of U.S. and British bases in the region. The Russians then told the Americans that the Jordanians had approved of the strikes in advance. U.S. officials said they checked with Amman and were told by their Jordanian counterparts that they had never given Moscow a green light. The Russians later told the Americans that their air command headquarters in Syria wasn’t in a position to call off the strikes because officers with U.S. Central Command didn’t provide Moscow with the precise coordinates for the garrison. U.S. officials said the Pentagon had never specifically asked the Russians to steer clear of the area around the At-Tanf garrison because it wasn’t close to any of the front lines between the Assad regime and opposing forces and because Russian aircraft didn’t operate in that part of Syria. Moreover, distrust of Russian intentions ran so deep within the U.S. military and the CIA that U.S. officials didn’t want to tell the Russians any more than they had to, officials said. The strike sharpened divisions within the administration. Military and intelligence officials said it showed why Moscow couldn’t be trusted. Administration officials in favor of the deal said the strike illustrated why refusing to cooperate with the Russians carried risks. Following the strike, the U.S. gave the Russians some additional information about U.S. operations along the Jordanian border. U.S. officials said they told Moscow to steer clear of the border area. But on July 12, as Mr. Kerry was preparing to fly to Moscow to complete the agreement to increase U.S.-Russian coordination, Russian aircraft targeted another base near the Jordanian border, about 50 miles from At-Tanf, used by family members of CIA-backed fighters and other displaced Syrians, according to U.S. officials briefed on the strike and rebel commanders. In the strike, the Russians used cluster munitions, which increased the number of casualties, according to Mr. Salameh and U.S. officials. Mr. Salameh said two young children, aged two and three, were killed along with two young women and a man in his mid-50s. In addition, 48 people were injured, all civilians, he said.